your number one priority in 2017! 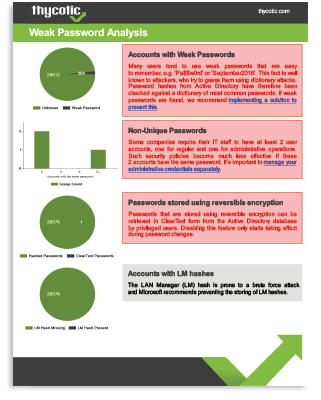 As the total universe of passwords grows to 300 billion by 2020, organizations across the world face a massively increasing cyber security risk from hacked or compromised user and privileged accounts. In 2016 alone more than 3 billion user credentials/passwords were stolen—that’s 95 credentials and passwords stolen every second. This report aims to assist cyber defenders and educate the wider global community through a statistical analysis of the massive password expansion and associated challenges that lie ahead. Far too many human and machine privileged account passwords are unknown, unmanaged and unprotected. It’s time to learn more about the problem, and how you can take advantage of highly affordable, automated password protection solutions available today. 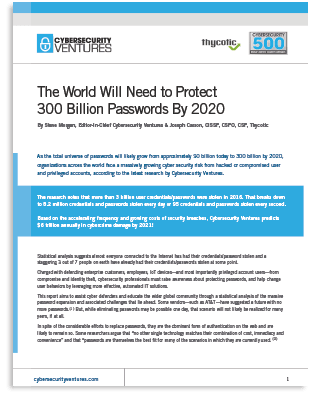 Cybersecurity Ventures estimates that by 2020 there will be at least 100 billion human passwords, and an additional 200 billion machine passwords requiring cyber protection. How strong are the passwords used at your company? This Free weak password discovery tool lets you securely analyze your company’s Active Directory passwords and determine your areas of weakness. It’s free, secure, gives you a full risk report, and you can run it as many times as you want. Here’s what you can do about it! Because of end user “security fatigue,” IT professionals are constantly playing defense, trying to manage passwords, change passwords and protect passwords. See how you can minimize security fatigue for both end users and privileged account users, and protect against outside hackers and malicious insiders. Keep critical, high-value assets safe with multi-layered privileged account protection. Protect your keys to the kingdom with the most powerful and widely adopted privileged access management security solution for the enterprise. By completing this form you are opting into emails from Thycotic. You can unsubscribe at any time.